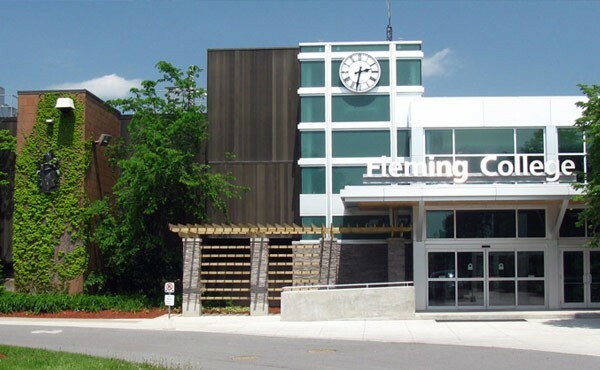 Fleming College is a College of Applied Arts and Technology in Peterborough, Ontario, Canada,which is also known as Sir Sandford Fleming College. The first students are welcomed in 1971. The college has more than 5,800 full-time and 10,000 part-time students and 71,000 alumni.Fleming’s Cobourg Campus is located less than one kilometre from Highway 401. The campus offers Academic Upgrading and numerous Continuing Education courses. Fleming College also offer more than 100 full-time programs in Arts and Heritage, Business, Environmental and Natural Resource Sciences, General Arts and Sciences, Health and Wellness, Justice and Community Development, Skilled Trades and Technology, and Continuing Education. Fleming College is famous in its excellence in dynamic environment and natural resources sciences as well as unique programs in business, museum management and cultural heritage,and social services. It also offers a number of post-graduate diplomas in Geographic Information Systems (GIS), Aquaculture, and Environmental Visual Communication.